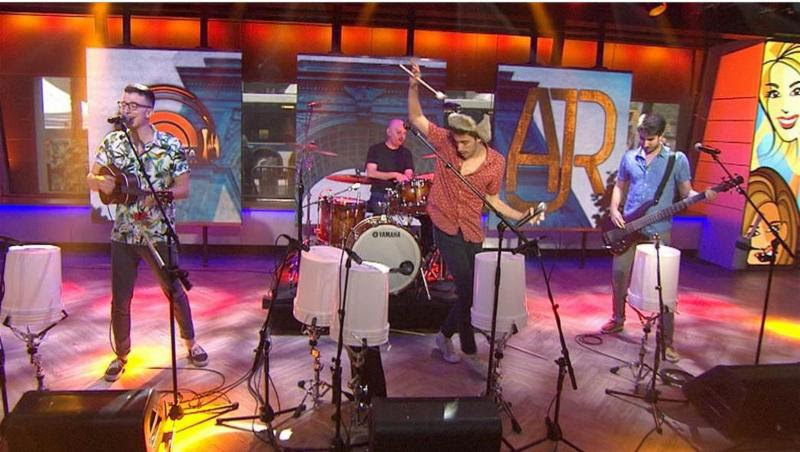 New York’s own AJR just performed their current single “Infinity” on NBC’s The Today Show this morning. The breakout indie pop trio joined Kathie Lee and Hoda, with guest co-host Elvis Duran, for a chat, before blowing them away with their performance. Following on from last year’s Certified Gold smash “I’m Ready,” “Infinity” is already making similar waves. The “stripped-back, folk-tinged pop song,” as Idolator described it, is now in heavy rotation on SiriusXM’s Hits1 and climbing their Weekend Countdown chart, currently holding the #14 spot. The single features on recently released debut album Living Room (AJR Productions/Warner Bros. Records), completely self-penned, -mixed, and -produced by the band in the living room of their NYC apartment. The three brothers will return to the road this summer, heading out on tour with Andy Grammer. Co-written by AJR’s own middle brother, Ryan, Grammer’s “Back Home” has been exploding in the charts lately, and was performed just last week on theAmerican Idol finale by Grammer and this year’s Idol winner Nick Fradiani. AJR will join Andy Grammer for his LA and New York dates in June, as well as the East Coast leg of his tour in August alongside American Authors. A full list of dates is below, and at ajrbrothers.com. AJR got their musical start ten years ago, busking on the streets and in the parks of New York. After their earnings enabled them to buy the basic tools to get started, Adam, Jack and Ryan sat down to begin writing their own brand of pop music. Raised on the vinyl of the ’50s and ’60s, AJR was initially inspired by the likes of The Beach Boys and Simon & Garfunkel, but the sound they’ve created has now been favorably compared to a modern mix of those classic sounds, with flavors of Imagine Dragons, Fun., and even hip-hop production elements reflecting Kanye West.